In celebration of Scotland’s magnificent wildlife, our annual Art for Animals exhibition is back, taking place later this month in Edinburgh. We have 14 artists who will showcase their creations, each having been motivated to carve, paint and sketch by the animals that make this spectacular country their home. The exhibition aims to inspire a desire to protect the creatures portrayed. The original art pieces will be on display to browse and buy from Friday 19th – Thursday 25th October in Breeze Art Gallery, 4th Floor of Jenners, with 30% of the proceeds from their sales being generously donated to support OneKind’s work. Each artist captures their wild muses in a unique way. This eclectic selection of painting and sculptures will produce an exhibition as diverse and exciting as the range of species we are lucky enough to live alongside in Scotland. Romain Pizzi is a specialist wildlife veterinary surgeon. 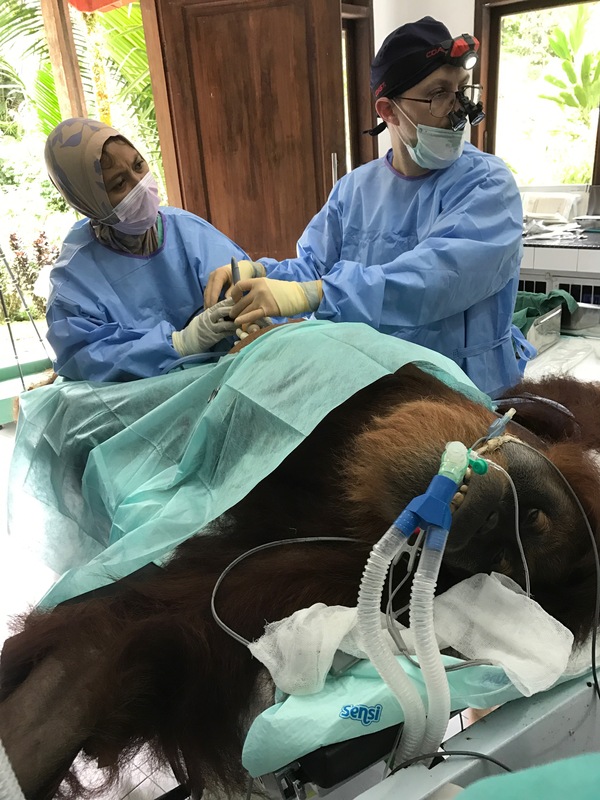 He works globally, and has pioneered ground-breaking operations such as keyhole surgery on an orangutan, and brain surgery on a three-year-old Asiatic black bear called Champa, in Laos. 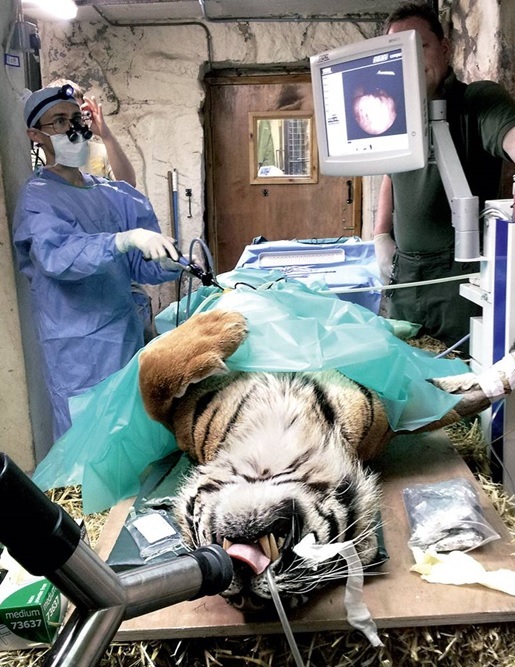 His commitment to the conservation efforts of endangered animals commonly hits the headlines* – especially when his procedures involve wild tigers anaesthetised on operating tables! However, it is his treatment and care of Scottish wildlife that means the most to him, and constitutes the majority of his work – our hedgehogs and curlews need heroes too! 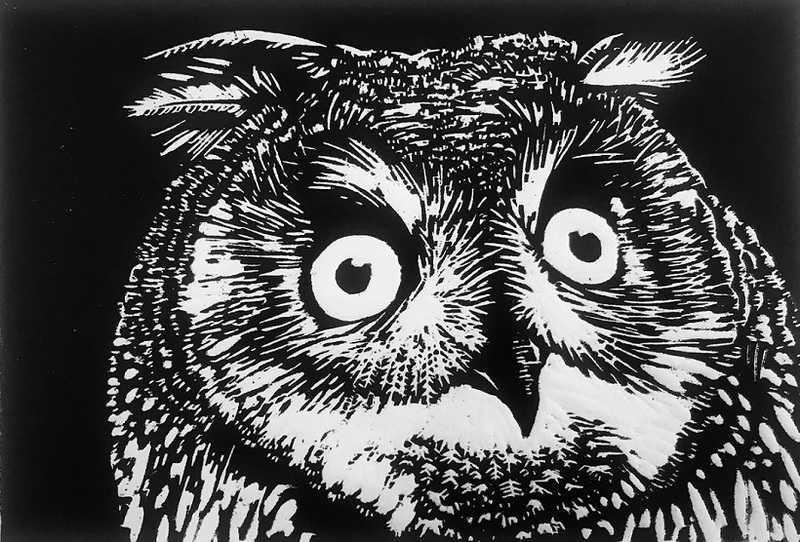 Woodcuts of Barn and Long-eared owls feature in his portfolio, as well as a red squirrel who was hand reared earlier this year before returning to the wild. He has engraved the image of a small leveret who was successfully released last month, and one grumpy Tawney owl who would hiss every time Romain entered the room. The art pieces will serve to represent these characters at the Art for Animals exhibition, to demonstrate how special Scottish wildlife truly is – and how crucial it is that we retain our fascination for our local fauna, and strive to defend it. A piece of yew wood, gifted from a tree that is still standing at the birthplace of Robert Burns, will serve as the canvas. The engraving, titled ‘Timorous Beastie’, will depict a fretful wood mouse, whose broken leg was treated before being successfully released back to the wild. Romain has drawn inspiration from and based this piece around Burns’ beautiful ‘To a Mouse’ poem. * Romain’s interview with Wired magazine. This blog is the first in a new series of blog written by our volunteer Gertie O’Rourke.